Happy Valentine's Day! 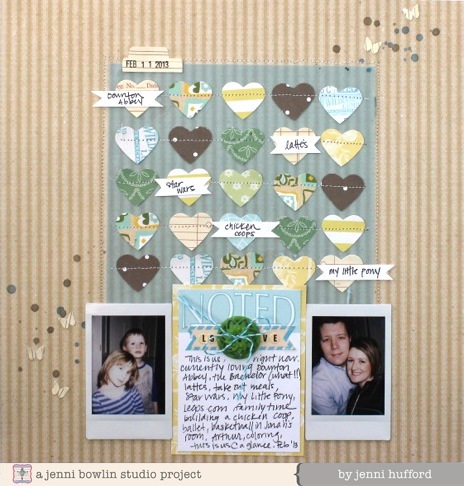 It's Jenni Hufford here sharing a "love" themed layout today using Modern Mercantile. Who says a Valentine's Day or Love themed layout needs to be pink and red? To be honest I really enjoyed using the fresh colors from the Modern Mercantile line to create this "love themed" layout! I used a heart punch to cut various papers from the Modern Mercantile collection. I layered the hearts in a grid pattern over a piece of vellum, and stitched the hearts in place. I used two instax photos and bookended them to one of the "Noted" card in the Modern Mercantile Hodge Podge paper. The focus on this page was to document a variety of things my family "loves" right now. I chose a few items from the list and wrote on little hand cut banners and layered these over the hearts. This is the perfect layout to include in my Project Life album for Valentines week!